New Native Press | A small press specializing in poetry, literary books, broadsides, and recordings. New Native Press is an independent small press based in North Carolina, USA, specializing in poetry, literary books, broadsides, and recordings. Thomas Rain Crowe is a Western North Carolina poet, translator, editor, publisher, recording artist and author of more than thirty books of original and translated works. Interspersing 48 poems by acclaimed North Carolina author Thomas Rain Crowe with 22 images from photographer Simone Lipscomb, a new book entitled Crack Light (Wind Publications, 2011) offers a meditative, resonant portrayal of Appalachia’s unique natural beauty. Crowe’s poems composed in celebration of that beauty are perfectly complemented by Lipscomb’s representational yet subtly composed photographs of places and creatures of the Blue Ridge and the Great Smoky Mountains. Most of Crowe’s works in Crack Light were previously published, yet the poems—each of which advances some poetic vision of the meaning of life in Appalachia—are reenergized from their proximity to Lipscomb’s visual interpretations of the region. For instance, the title poem “Crack Light” (referring to an Appalachian dialectical term for the sunlight that enters a cabin’s or barn’s dark interior through cracks in logs) benefits by being juxtaposed beside Lipscomb’s photograph of a Cades Cove cantilever barn (similar images on the book’s front and back covers further enhance the impact of the book’s title poem). The concept of “crack light” serves as a central metaphor for this fine book: given the region’s mountainous, thickly wooded terrain, Appalachian visions, however profound, often are indirect, partly subsumed by shadow. Granted Crowe’s extensive Beat affiliations, his writing is far from imitative. He has long immersed his imagination in the natural and cultural life of Appalachia, yet his work has universal implications. As Jim Wayne Miller put it, “Crowe is a new kind of literary voice in which both local and global perspectives are compatible, even requisite.” Returning to his native Appalachia from California in 1979, Crowe drew inspiration for his poetry from the work of major regional literary figures, including James Still, Fred Chappell, and Marilou Awiakta; simultaneously, he read and learned from such nationally prominent environmental writers as Wendell Berry and Thomas Berry. 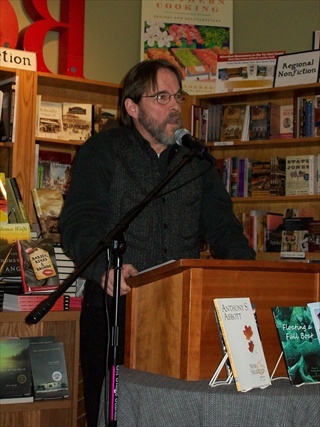 In two non-fiction books, Zoro’s Field: My Life in the Appalachian Woods (University of Georgia Press, 2005) and The End of Eden (Wind Publications, 2008), Crowe presented nuanced interpretations of environmental issues affecting Appalachia today, and the poems in Crack Light grapple with similar concerns. In the poem “Seed,” for example, Crowe identifies the redemptive power of a seed in healing a compromised place, and he suggests that, figuratively, people are seeds of a healthier future. the seed slips into the wounded earth. the seed starts to take on new life. it’s time to plant corn. Crack Light offers readers a range of profound if at times shadowy glimpses into overlooked or neglected places across Appalachia, and in the process the book illuminates the essential nature of those places. Crowe’s poems and Lipscomb’s photographs work in tandem to transport the reader into the heart—and, if the reader opens his or her heart to the book’s charms, into the soul—of Appalachia. A nice review of The Brucciano Poems. “For awhile now I have been fixated on finding the perfect place. The place that feels like the euphoric rush and sudden peace of the first sip of thick black coffee in the morning. It’s that calm, the stillness and relaxation that I think I am seeking, but that I never take the time or risk to actually find. It is also that surreal peacefulness and lush richness of life that that the new collection from Thomas Rain Crowe captures. I can clearly see Crowe sitting at the little wooden table in front of the open window absorbing Italy and attempting to capture that feeling. He uses a series of scenes and lives to try and convey his experience in Brucciano, Italy, and does a fantastic job. Click here to view the original review. Thomas Rain Crowe reads a selection from his latest book of travel poems, The Blue Rose of Venice.